1081 Penny Commonwealth S.3222 and Halfgroat S.3221. AVF. 1804 Crown 1653 Commonwealth mint mark sun, R. shield of St George and Ireland. Almost extremely fine. 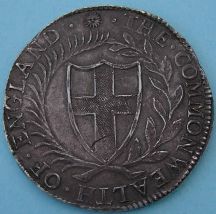 759 Shilling 1652 Commonwealth m.m. sun. Good very fine. 724 Half Groat Commonwealth S. 3221. Very fine. 1332 Commonwealth. silver half groats (2), fine and very fine.